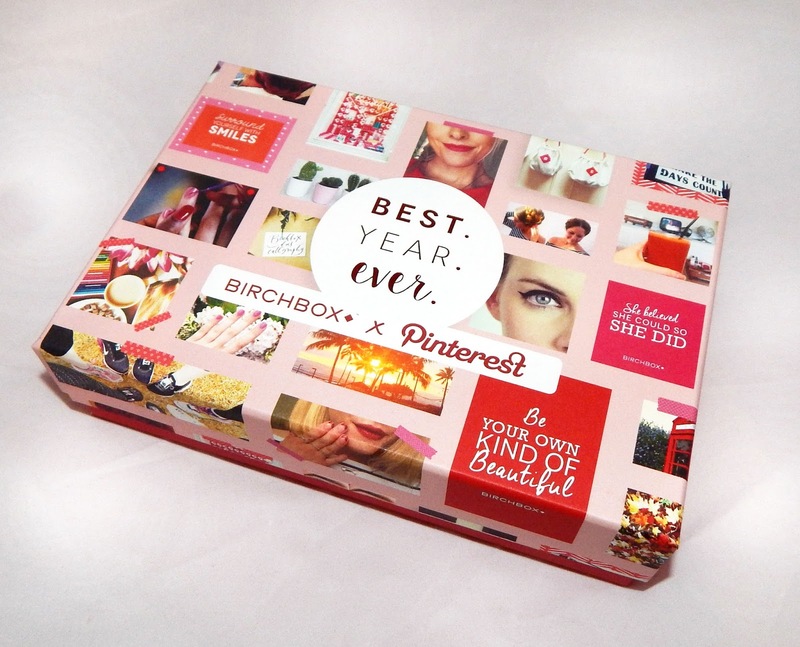 This month Birchbox has teamed up with Pinterest to give us the best year ever (excuse the pun). I've been so excited to receive my January box because I knew that there was a Benefit item inside plus a full size item too. The box design this month is of course Pinterest themed with lots of pinned images on it, the box was refreshing to see; I love getting themed boxes because I use them as storage and its nice to display the different designs. Inside the box was the usual fabric branded Birchbox bag with my items in along with the content card but this month there was also an added extra. 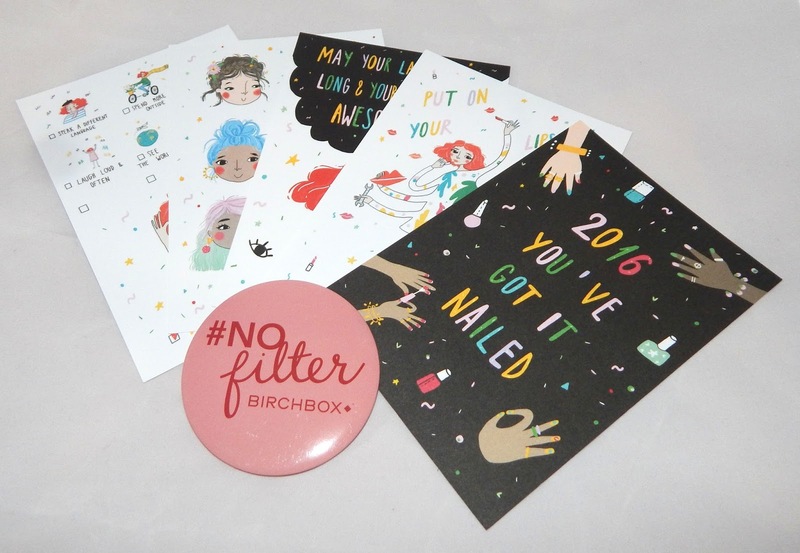 The very talented Viktorija Semjonova of And Smile Studio has designed illustrated postcards for Birchbox, the postcards was all New Year themed and there was 5 included in the box. I plan to use some of these in my blog photography in the near future. I was lucky enough to get a free sample of this Benefit Tinted Lash Primer in Elle Magazine a couple of months ago so I already knew how good the product was. People may think what do I need a lash primer for...? Well I have found that when wearing this lash primer under my usual mascara my lashes look longer and the colour of the mascara is more intense. I have worn the lash primer without any mascara over the top as well, because the product is tinted it can be worn on its own too. The look is more natural and less bold when just wearing the primer alone. The wand is the same design as the They're Real mascara which I expected since its from the same range of products. The wand is long enough to catch all your lashes in one sweep. I'm so happy that I received another deluxe mini size sample of this primer, the minis usually last me around 6 months too which is great!! I've had a few Jelly Pong Pong items in past, a few from beauty sub boxes and I really love the products. Not only are they a cruelty free brand but the products are very innovative and good quality. This Lighten Up pencil is great for highlighting your brow line and applying to the inner eye to enhance your eyes. It's a chunky sized pencil which will fit into your makeup bag, handbag or even your pocket so its easy to take anywhere with you. The quality of the product is again amazing, the highlighted shade achieved once applied is spot on, you can easily blend the product out with your fingers or a brush. It's a good size product to highlight any hard to reach places that a brush might not reach well enough too and its so easy to use because it's a pencil style product. A detangling spray for adults was my first impressions of this product, I've not used a detangling product since being a kid but I have used protector sprays a lot. I do straighten my hair after nearly every wash so a protector spray is needed, I'm currently using 2 products one from Lee Stafford and a Got2Be combination product, both do what they say they do and have different qualities. First of all the smell of this Beauty Protector is lovely with a slightly fruity scent and the design on the packaging is unique, it makes me think of a classic rock chick product. I've used this product a couple of times since receiving my box and I can confirm that it detangled my hair, after spraying I ran my brush through my hair at ease, as for heat protection it did the same as my other products in that my hair didn't feel rough or dry after straightening. The bottle states that this product also protects the hair from UV rays, smooths hair, locks in colour, adds shine and conditions. I would recommend this product especially as it says its locks in colour which my other protector sprays don't so it would be great for anyone with coloured hair. 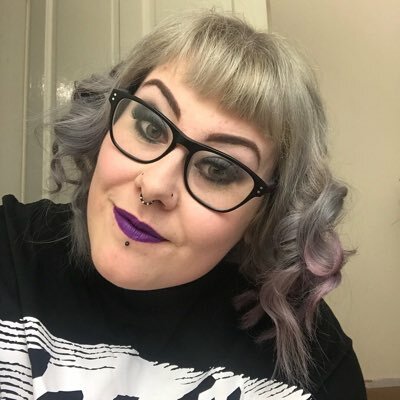 In the last few months I started to use cleansing water to remove my makeup, I've used one from Soap and Glory and the Garnier Micellar water so far and I have continued to use them after achieving good results. This Absolution cleansing water is an expensive product for my funds at £27.00 for a full size bottle and when it comes down to it, this product gives me the same results as my Garnier product does which only costs me £1-3.00 depending on bottle size. I haven't got much else to say about this product, if you have tried cleansing water before then this is just the same as the rest for me. I'm not a big fan of anything with a nutty flavour or smell in it, this is an almond body butter that does slightly smell of almonds as expected but it isn't over powering at all. I like the texture of this body butter, it's quite dense so it doesn't run everywhere when applying, the cream also drys quickly which is another thing I like. My skin was left feeling really soft after applying the body butter, I will probably use this sample up but I wouldn't buy it in the future just for the simple reason that the smell isn't what I like. If this body butter came in a strawberry scent I would be all over it, well it all over me I guess. After receiving a clutch bag last month I thought it was really nice that Birchbox included a compact mirror in this months box. I feel as though Birchbox is kitting us out with everything we need. The mirror is on one side and is a decent size too, the other size has the hashtag 'NOfilter' text on it with a pink background. I have included the postcards that came in my box in the photograph below, I love the quirky designs and slogans on them. This is my 4th box from Birchbox and I can't fault the service, samples, box designs and quality of products in the boxes I've received. 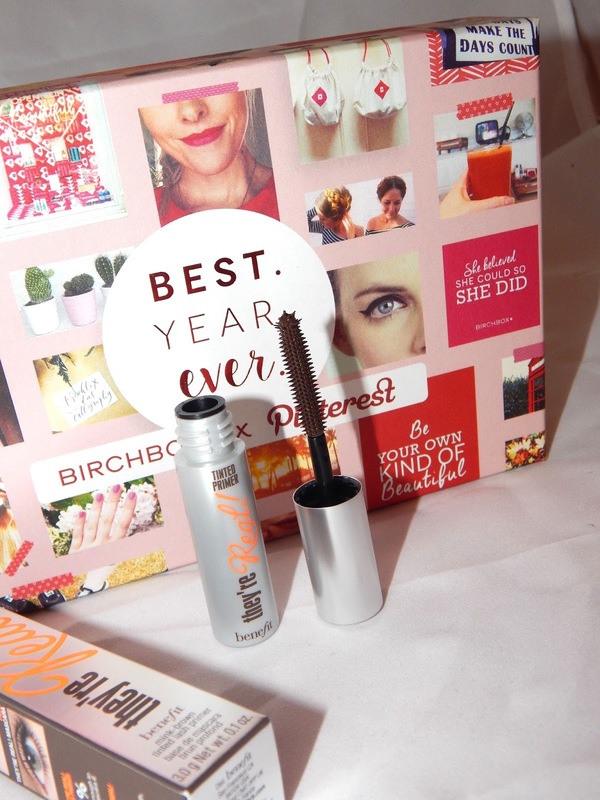 There has been products I won't buy in the future and there has been some amazing products that I wouldn't of known about if I hadn't tried them in Birchbox. Another thing that when you review your box and products on the Birchbox website, you are awarded with Birchbox points which you can use to buy items in the Birchbox store, I think this is a great way of purchasing the full size products of samples received in the monthly boxes. Birchbox are debuting their very own exclusive Birchbox-made makeup brand LOC (Love Of Colour) in February's box so that's got me very excited for next months box!